Flying Officer Douglas Gartery, 128972, Navigator, 419 (RCAF) Squadron, Royal Air Force Volunteer Reserve. Douglas Gartery was born in the Spring of 1920 in the Huddersfield area, the son of Willie and Jessie Gartery (nee Field) of Horbury, who had married in 1920 in the Glanford Brigg Registration District in North Lincolnshire. Douglas had a younger sister, Sheila, who was born in 1922, also like him, in Huddersfield. The Gartery family moved to Horbury from Thongsbridge, Huddersfield in 1929. Douglas Gartery was educated at Horbury Council School, then Ossett Grammar School and he went on to Leeds University, earning a B.A. degree. He was a server at St. Mary's Church, Horbury Junction and also taught in the Sunday School there. At the time of his death, Douglas Gartery was engaged to my cousin Kathleen Wilson of Horbury Bridge, who found her loss hard to bear and didn't marry until 1954. Flying Officer Gartery was based at Middleton St. George, near Darlington, the most northerly of Bomber Command's airfields. 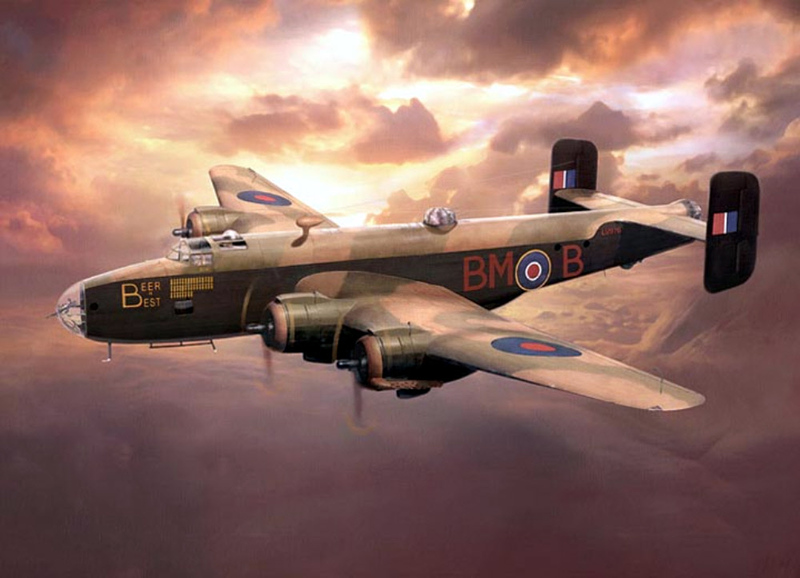 He was the navigator of a Halifax bomber crew of 419 (RCAF) Squadron, which comprised mostly Canadian personnel. 419 (Moose) Squadron had moved to Middleton St. George from nearby Croft in November 1942 whilst still in the process of converting to the big, four engined Halifax bomber with its seven man crew. Bomber operations continued non-stop at the stage of the war, so the station was active 24 hours each day, with planes coming and going all the time. Gartery was the part of the Halifax bomber crew of Canadian pilot Arthur "Art" Stanley Green, whose parents were English and had emigrated to Saskatchewan, Canada in the early part of the 20th century. Sergeant Art Green's first operation with his own crew was on February 13th 1943 and it was marred when the intercom to the rear gunner became unserviceable, so Green returned to base. During this operation the Bomb Aimer was P/O Henry Enever who later became a POW after the loss of WO Glen McMillan's Halifax JB-791. After this operation the Bomb Aimer would be Sgt. Alfred Brockway, RAF, who had previously completed approximately 13 operations. The crew's next operation was also hampered with problems, this time the rear turret guns were unserviceable so once again, Green returned to base. March 1943 would see the crew complete a number operations, but not without mechanical problems. Heavy flak caused damage to the starboard engine and they had to land at RAF Thorney Island. A few days later engine problems again struck their aircraft. The crew had a number of changes to the mid-upper gunner duties, the original gunner Sgt Therrien returned to the crew for their fourth operation, but on April 4th he lost consciousness because of oxygen system problems and the pilot Sgt. Green returned to base. Sgt. Therrien never did return to the crew and six different gunners filled the position for the next six sorties. On the operation of the night April 14/15th 1943, Green's Halifax was attacked by a fighter at around 01:08 causing a leak in the glycol leak to port inner engine. "We next encountered a single searchlight and streams of tracer. The rear gunner, Sgt. Gowling used guns on the searchlight until his guns failed. He refused help, and said the gunbelts were severed. The port inner engine burst into flames and holes appeared in cowling. I used a fire extinguisher, but with no results. The rear gunner shouted once, then there was more tracer and lights; we seemed to be at about 2,000 feet. I reported No. 2 tank on fire. The skipper then said "I guess we've had it boys. better get out, any of you that can." There was no-one on the intercom except the pilot, the mid-upper gunner Sgt. Prieur, who stood beside the pilot, holding the latter's chute and myself. I picked up a hand extinguisher and leaving my station with all fuel and remaining engine instruments reading normal, I approached the flare chute, where a small fire was burning. I intended to throw the photo flash out the door, but an explosion knocked me out. At some point the Halifax bomber crashed and burst into flames, presumably when Flight Sergeant Dunn was unconscious. Seconds later the plane exploded and I was knocked unconscious and came to, on my back in the centre of the plane with burning oil dropping on my face. At first I thought we were still airborne, then I noticed a tuft of rye grass sticking through a hole in the fuselage. The plane was a ball of fire with flames 100 ft high and it was then that I realised that the burning plane was on the ground. I tried to open the door but it would not move so I crawled out of the hole where the grass appeared. I got out and found I was blazing like a torch, so I rolled around on the ground, to put out the flames and looked around for survivors without success. My clothes burst into flames again so once again I had to roll around in the dirt. I went to the rear of the plane and saw that the tail turret and gunner were missing and no sign of life anywhere and the whole plane was ablaze. The aircraft was pointed North, with a house twenty yards to port, trees fifty yards behind, and a hedge in front. The Germans later told me that six bodies were found. My watch stopped at 01:40. I left the area immediately as the ammunition began to explode in the heat. I walked about 2 miles until the first streaks of daylight appeared and found I was in a farmer's field with bundles of grain stacked around. I found a pole and vaulted onto the top of a stack, threw the pole as far away as possible and dug myself into the stack to wait until nightfall." The cut-off shout from the rear gunner may have been him being hit. It is noted elsewhere that the tracer could also have come from a night fighter even though the gunner was aiming at putting out the searchlights. There could have been a combination of both which caused the loss. VR-U came down near Munchengladbach and the original burials took place at Hauptfriedhof. It was F/S Prieur's first operation with the Green crew, his 4th operation. in total. WOII Green, F/O Gartery, F/S Gowling, Sgt. Dunn and Sgt Harrison all completed 11 operations together. They began fourteen operations but on three operations	they made early returns. Above: Handley-Page Halifax bomber in 1943. 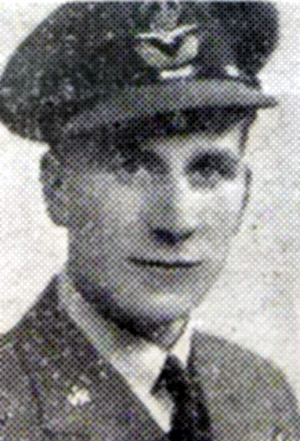 "Horbury Pilot Officer Missing - A telegram was received by Mr. and Mrs. W. Gartery, 120 Quarry Hill, Horbury, on Monday, informing that their only son, Pilot-Officer Douglas Gartery (23), was missing on operations during the night of May 23rd/24th 1943. A letter from him dated Saturday shows that he was in the best of spirits. The Church of England chaplain at his station has since written to the parents expressing deep sympathy with them in their anxiety. A native of Thongsbridge, Huddersfield, he came with his parents to Horbury fourteen years ago and was educated at Horbury Council School, Ossett Grammar School and Leeds University. After obtaining his B.A., he had a fortnight's holiday and then joined the RAF in September 1941. He had previously been in the A.T.C. attached to his University. He received his training in the U.S.A., and on returning to England last summer was posted to a Royal Canadian Air Force station here. He had been on a number of operational flights over Germany and the occupied countries and only recently was in a machine which shot down an enemy fighter. He attended St. Mary's Church at Horbury Junction and was a server and Sunday School teacher. He was engaged to be married to Miss Kathleen Wilson, Horbury Bridge." Flying Officer Gartery died on the 24th May 1943, aged 23 years, with five more members of his crew and is buried at Rheinberg War Cemetery, Germany in Grave 2. G. 14. The town of Rheinberg lies in the west of Germany approx 85kms to the north of Koln in the Nordrhein-Westfalen region. 2. "Ossett Observer", Saturday, May 29th 1943.